So, they arrived yesterday morning. I'm in love and as someone said in the CAS forum's it is relaxing and you could spend hours using them. I love them. But alas, at the moment I don't have watercolour paper and its difficult blending as such, but still so much fun. Its great seeing an image come to life. So anyways, they arrived yesterday and it wasn't until 6 in the evening that I got to play with them :( but they are fantastic. I might graduate to promarkers in awhile as I am dying to give them a shot too. But I must stay away from the tempting delights of the CAS shop for at least a month. Oh someone, please take away my 3v card! Please . . .?! No but thank you for the suggestions on alternative paper. I did notice the watercolour paper was a bit on the dear side. Not nice to the budget at all! I shall look for some of the paper you have suggested. Thank you Jess! love your colours Lorraine and your blog is great ..
Love the blog Lorraine and wow what a fantastic first attempt at watercolouring - you'll be flying it no time. I find it very relaxing. 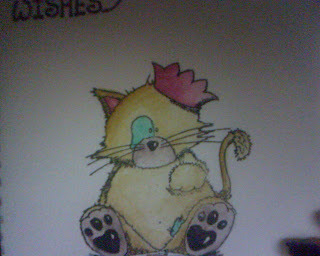 great colouring.....I am still learning how to use the watercolour pencils.....tis a fun way to spend the evening!!! love your blog background, am a big fan of the gorjuss girls!!!! @Lia: Thank you for the compliments! @Dianne: Seriously Dianne, give me some stamps, staz-on, pencils and a cup of tea and i'd be colouring away happily for hours! I have that Watercolour Paper in my 'stash' as we speak! Thank you Dianne! @Charmz: Aren't the gorjuss girls LO's fab! Ugh, i wanted to use everyone of them but i've already changed my background so often i'll stick with this one for awhile! Great colouring and its so cute. Hi! I'm Lorraine, 24, just got into crafts and card making recently. I live in Dublin with my parents and dog, Patch. Love being arty. Can't draw or cut a straight line to save my life but I'm learning!